Sight is the coyote's most important and acute sense, then smell and hearing. They can run at up to 40 miles per hour. 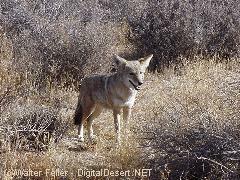 Coyotes evolved in grassy plains regions where sight and speed were the most important factor in catching rodents. Rodents still make up approximately sixty percent of the coyote diet. The omnivorous coyote will also eat seeds, insects, fruits, fish, lizards, birds and carrion.